Usually people spend the days leading up to a trip choosing their clothes, planning their itineraries, poring through guidebooks and circling what they want to see. It’s supposed to be an exciting time; heck, half the fun of travelling is planning the trip. But unfortunately, thanks to a dreadful stomach bacteria, I spent the days leading up to my Taiwan trip with my head stuck deep in the toilet, staring at the porcelain, and wondering whether I would make it on the plane! Thank the Flying Spaghetti Monster for the miracle of antibiotics. And I suppose I have to thank the Big Blue Machine for their wonderful health care system so that I can get lots and lots of free drugs to help me stop barfing. By Thursday evening I was feeling a bit better, even though I still couldn’t eat, I made it to the airport and got myself on Eva Air direct to Taipei. It was really only on the plane that I started planning what I was going to see over the next three days. Seiji was there for work, so during the day I’d go sightseeing and at night we’d go gallivanting. I wondered, how much can I squeeze into three days? And more importantly, how on earth could I visit a place that is famous for its street snacks and maintain self control to not eat everything in sight on account of my bad stomach? The doctor had told me to try not to eat anything too spicy or exotic so as not to further upset the stomach. Hmm, this advice would be hard to follow. Taipei proved to be a very cool little city. Well, not so little, really. In fact, quite big and spread out. But easily navigable, well organised, and enjoyable. I was highly impressed with their public transport system. The subway was amazing, there were lots of signs in English to show you the way, and people were really helpful if I looked a little bit lost. It was very easy to hop on the train and then just wander around the streets, bathing in incense in the temples, poking around in the markets, and taking in the atmosphere. I’d heard from many friends that the Taiwanese were very friendly and mellow, and their reputation proved true. I was impressed by how nice the people were, and so well mannered compared to… well… I won’t call any names! They move at a slower pace there, and even though it is a bustling city with lots of cars and motorcycles and traffic all over the damn place, the people somehow seem strangely laid back, as though nothing phases them. The street food also lived up to its good reputation. Eating for the Taiwanese seems to be something best done outdoors. 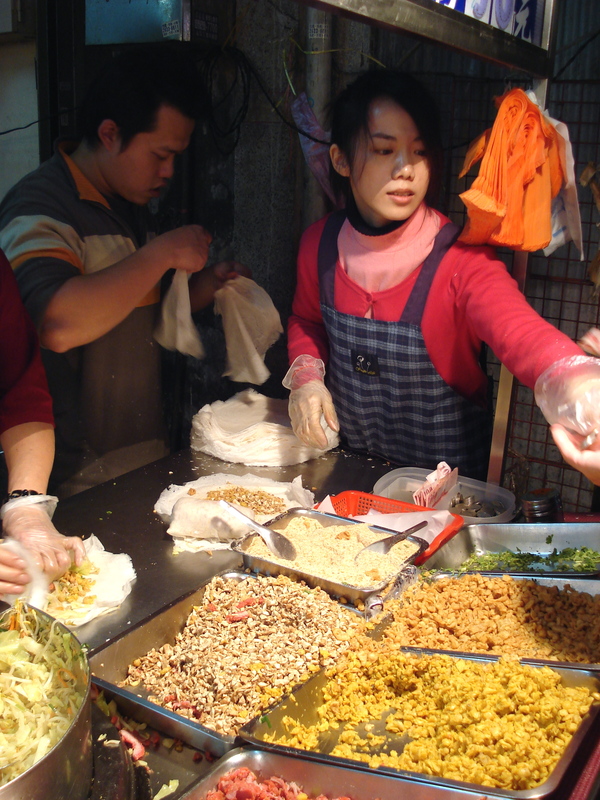 All over the sidewalks and alleys are little street vendors, selling all kinds of eats for hungry passers-by. 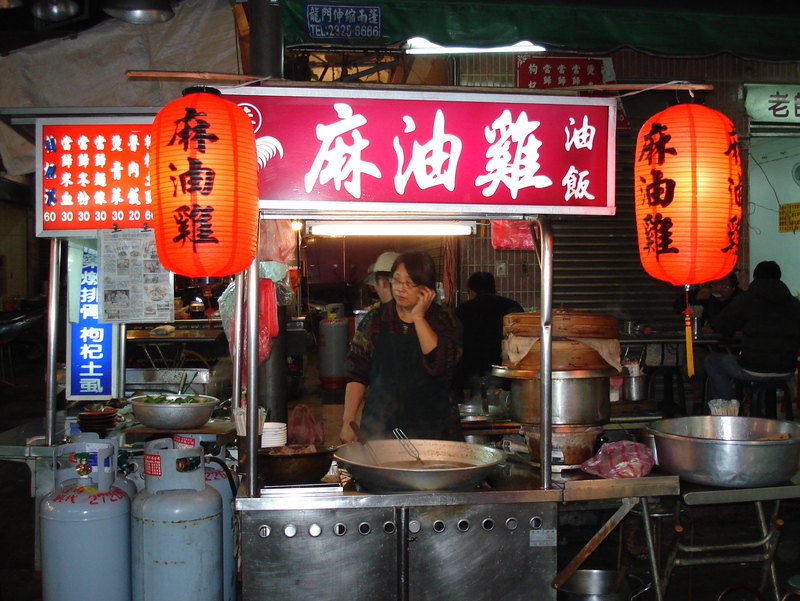 Steamed dumplings, rice balls, noodles, soups, Taiwanese sausage, and even sushi can be bought on the roadside. It’s fast and tasty and incredibly cheap — as little as 5 cents (US). So tempting, but I had to be careful. My stomach wasn’t back to normal just yet. 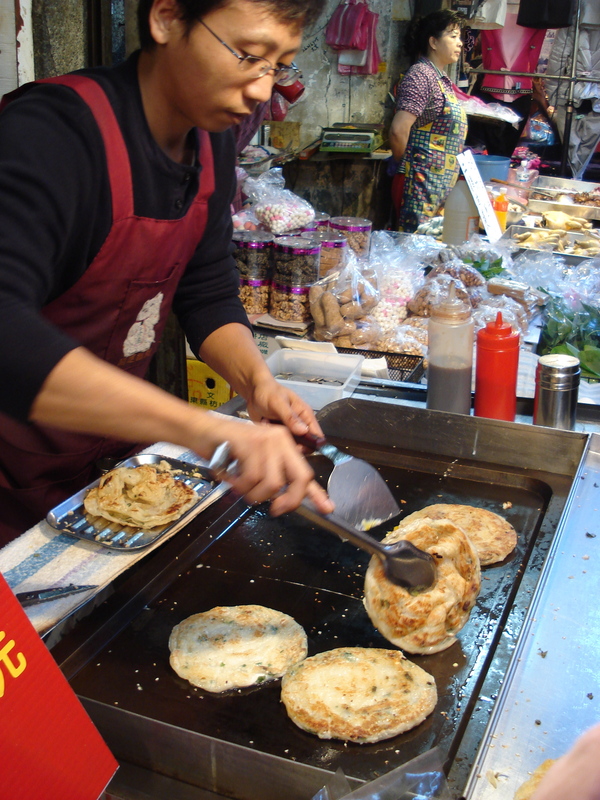 My favourite street food was a simple dish called dan bing: a sort of flatbread, almost the texture of roti paratha, infused with little green herbs, grilled on top of a scrambled egg, doused with a bit of red chilli paste, and folded in half. I ate one of these every day. Late one afternoon after visiting the famous Confucius Temple in Shilin, I wandered around looking at the various snacks, and got in line at one of the stalls. A young Taiwanese guy, about 15 years old, came up to me and said in a perfect southern accent, “Ma’am? May I recommend that you try this one instead? This is the real deal, I promise you. Come on, switch lines. You gotta try to this China Pizza.” He turned out to be an American born Taiwanese who grew up in Tennessee, which would explain why he called me “ma’am”. And he was right, the flatbread was incredible, soft and crispy, juicy and spicy. I sat down on a bench in the warm sunshine, watched the people go by, and munched on it, happy as a pig in mud. In fact, I must have looked pretty damn happy — the locals who were passing by kept smiling at me. ‘Dan bing’ in the making — and about to be devoured, by me! But I have to say, even though I have an adventurous stomach, there is one thing I absolutely cannot and will not ever put into my mouth — stinky tofu. One night we ventured to the a street market and I was immediately confronted with that unmistakable smell. Westerners have described it as “dead dog”, “rotten dead dog”, or “rotten dead dog with gangrene and maggots covered in vomit lying on top of a week-old heap of garbage festering in the sun”. All of these descriptions are fairly accurate, but make no mistake; it’s tofu. Why is it so stinky? I couldn’t tell you. But if you see a huge vat of some kind of bubbling red chili-looking liquid with big chunks of something sort of white in it, then you’ve found the source of that smell. I mostly used my guide book and the tourist map to figure out what I wanted to do and what I should see. I was pretty happy with what I saw, but I have to say that one thing that was a major waste of time was the famed Taipei 101. What a crap attraction! The view of the city was quite good and your stomach does somersault as you look down from the top. But the building itself is not so interesting, and then you are forced to walk through their massive gift shop full of dead coral jewellery to get back out. Definitely not worth the NTD 400 that you spend to go up in their super fast elevator. For visitors to Taipei, I would say this is one thing you can definitely skip. 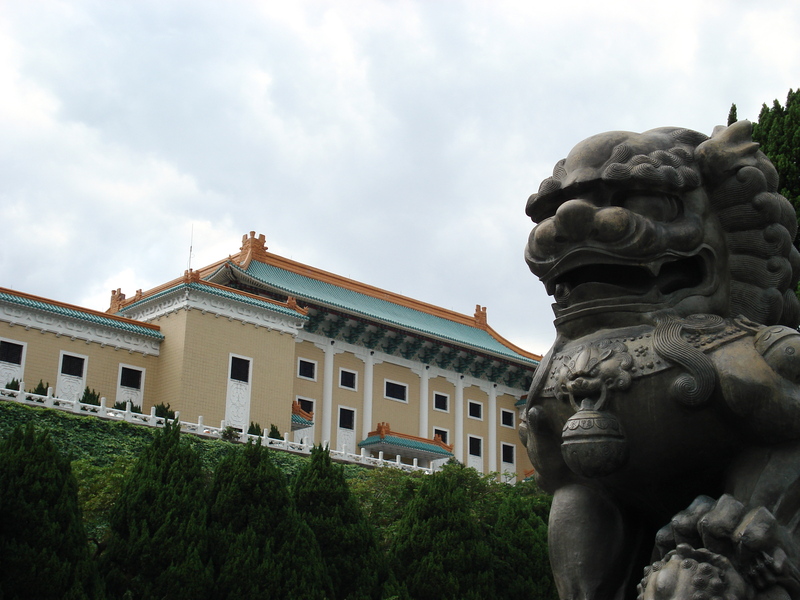 The National Palace Museum was also said to be something you absolutely must visit when in Taiwan. It was indeed quite good, but really far too big unless you have the stamina to spend eight hours there. It was worth the visit, and the relics and art were impressive, especially a very famous “jade cabbage” which everyone was making a big fuss over. Outside of the museum are some beautiful gardens and some ponds, and it’s very nice to walk around in. On my last day I only had about six or seven hours before heading to the airport, but we decided to make a little day trip out of the city and into a smaller town to the north called Danshui. It was the very last train stop of the MRT system and it deposited us into a quieter, more rural part of Taipei. Next to the Danshui river and close to the sea, it was a really nice town. I was the only foreigner there, so I got a few stares, but I didn’t mind. Munching on a stick of mochi — little sticky rice balls, so yummy! And a whopping 10 Taiwanese cents! Walking down the old village road, we wound through tiny alleyways and suddenly found ourselves smack dab in the middle of the busiest, narrowest, most crowded little street market I’ve ever seen. Clothes, fresh fish, meat, sweets, food, snacks, fruits and veggies, anything and everything was on sale, and it seemed like every resident of Danshui was passing through to do their Sunday morning shopping. It was a claustrophobe’s worst nightmare but good fun to be trapped in the middle of it. We grabbed a few snacks, followed the tight flow of the shuffling people, and were eventually excreted out of the market and back into the streets. We walked along the Danshui river where people were generally taking it easy, walking their dogs, eating ice cream. It was nice. Really nice. Madness in the market…. I don’t know what that is, but can I have one, to go, please? From Danshui it was back to the hotel, hop on the bus, get into the airport, and on the plane. Wish I could have had some more time, not so much to see Taipei but to see some more of Taiwan. I read how the north coast is beautiful, there is a gorge I would have loved to hiked, and the south coast is supposed to be gorgeous, with diving, surfing, nice beaches and marine parks. 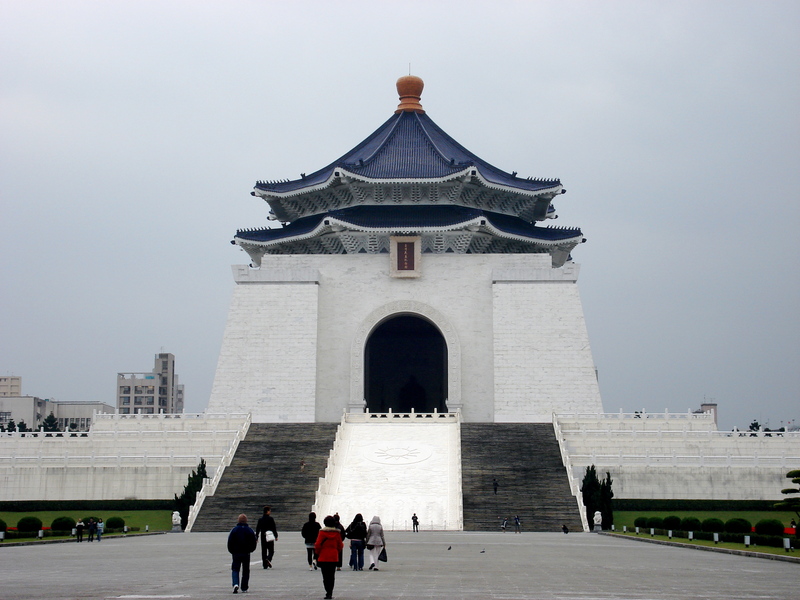 We actually saw very few tourists around Taipei, and I’ve heard that it is one of the most underrated countries in south-east Asia. What a shame!